This rustic dwelling was once a log cabin in the early twentieth century. The State of Tennessee Real Estate Assessment Data records the house as being built in 1900 but The University of the South's Lease Holder's records state 1913. It was originally occupied by Joseph Riley from 1913 until 1946. Floyd and Madeline Yates were the next owners followed by Jame E. Terrill, H. Rogers and Christie Thomson, Christie Taylor and then Charles Beeler and Paula Hunter Brush. The Brush's purchased this one-story structure in 1985. 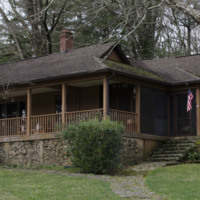 “Beeler Brush House,” Online Exhibitions and Digital History, accessed April 18, 2019, http://omeka.sewanee.edu/document/874.